Edinburgh Capitals forward Mason Wilgosh admits fans could be in for another “feisty” affair as Caps travel to Braehead Clan tomorrow, the first of two important Gardiner Conference games this weekend as Edinburgh try to claw their way off the bottom of the Elite League. The sides last met over the festive period, and there was little goodwill on display. 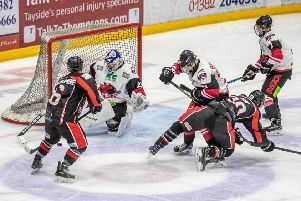 Edinburgh were beaten 7-3 at Murrayfield, but only after the game boiled over following Corey Cowick’s check-to the-head and a sucker punch to the face of Edinburgh’s Jared Staal, resulting in a concussion for the former Carolina Hurricanes winger. Cowick (four games) and Capitals’ defenceman Rihards Grigors (two games) were suspended following the ill-tempered affair – Grigors for a cross-check, late in the game, to the back of the head of Clan blue-liner Cody Carlson. Wilgosh, when asked if a match like that can be used as a motivational tool for tomorrow’s encounter, said: “Yes it can, we’re in for a hard game, and what happened last time will be in the back of everybody’s mind. We all remember, and the best way to get back at them for what they did to us is to beat them on the scoreboard. “It’s a fast, physical sport and sometimes things like that happen in hockey. It will be a tough battle, and it could be another feisty one. “Braehead is the first of two huge games. These Conference games are so important, we play each other all the time, we’re all close to one another in the standings and we’re all battling for the same spots. Staal, with 13 goals and 15 assists for 28 points in all competitions, is third in scoring for Edinburgh, and has not played since the incident, missing the past five games. However, it is understood he is back in training and could figure at some point this weekend. Wilgosh continued: “We’ve really missed him these last couple of weeks. Edinburgh complete their weekend by entertaining Fife Flyers at Murrayfield on Sunday (face-off 6pm). The Kirkcaldy outfit, led by experienced and red-hot forward Ryan Dingle, have made light work of Edinburgh recently winning their last two encounters, outscoring Caps 15 goals to six in the process with Dingle having a hand in nine of them.